Grant Murray and Paul Di Giacomo are close to signing new contracts with Kilmarnock, but goalkeeper Graeme Smith could be leaving in the summer. 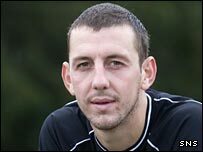 Defender Murray has agreed a new deal with the Ayrshire club, but Jim Jefferies says that Smith has rejected a new contract. "Unfortunately, Graeme Smith has turned his offer down and he's trying to get an offer elsewhere," says Jefferies. "That's his perogative, and I hope he goes on and gets it and gets on well." Jefferies also hinted that striker Di Giacomo is close to successfully concluding negotiations and Murray has accepted an offer, but has yet to sign. "I've had talks with all the players and the agents all last week, and Grant Murray is the only player who has accepted a new two-year contract. "All the talks have been done, and the offers have been made, so it's now in their hands, and I would imagine they'll all start giving me their answers."